I was working all of Sunday and didn’t leave the flat other than to go to the gym. It was my birthday on Monday so I spent most of the day with the family. I’ve had a ‘no work on my birthday’ policy for the last few years (I would even take the day off when I worked in London) and managed to stick to it this year. At about 10am, the guy from security came up and told us there was going to be a fire drill and we’d have to leave the flat. I was a bit annoyed because I’d seen the signs next to the lift the day before and specifically asked him if we’d have to leave and he said it was just to test the fire alarms. So, instead of waiting for the fire alarm to go off at 10.30 and having to walk down 23 flights of stairs with two kids, I got ready for the gym and made a cup of tea while my mum and sister put V2 in his stroller. We went down in the lift and just waited for everything to kick off. Dad decided he was going to stay in bed (no, I’m not joking). Once the alarm went off, some people came out of the building while others just watched from their balconies (again, I’m not joking). The fire engines came, the paramedics came. V1 was thrilled to see it all in real life but it was a joke. Forty-five minutes after the alarm had gone off, people were still strolling out of the building in no rush whatsoever. Once everyone was allowed back inside, I went to the gym. Later that day as I told friends about the fire drill, they said ‘Oh, wow. You got to see some real firemen on your birthday. What a treat!’ I had to point out that these weren’t New York firemen, worthy of a calendar page – these were short, stocky men from Kerala and Tamil Nadu! On Tuesday afternoon, Vs 1 and 2 had been invited to a friend’s daughter’s second birthday party. The party was at G’s Cafe in JLT and V2 cried all the way there. When we got to the party all the kids were with the entertainer already and the mums were having tea and coffee and finger sandwiches and little pastries. It was really nice. I even met someone that I knew but hadn’t seen in about two years! When it was time to cut the cake, we all went into the cafe – and there were some amazing cakes on display! After having a bite to eat, we headed home. V2 had slept the entire time we were there and woke up just in time to cry all the way home in the car. I had a gym session with Trevor on Wednesday and a piano lesson in the evening. I tried to do as much work as I could as I knew I wouldn’t get much done at the weekend. 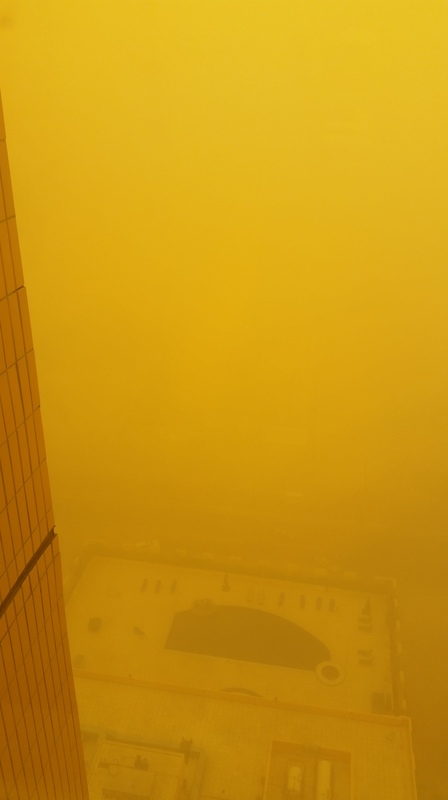 I woke up on Thursday to the most awful sandstorm. Visibility was almost zero and the world had taken on a bizarre natural sepia filter. I couldn’t see the Shangri-La next door or even the street below. Someone told me there had been a weather warning and that this was going to last all weekend. I panicked as I’d booked my birthday drinks at Calabar and had reserved an outdoors space. I sent the manager of the bar a neurotic email and he called me back a few hours later to say that it looked like the sandstorm was improving (it was) and that they were opening their outdoor area that evening (phew) and that it would be fine tomorrow (it bloody better be). I worked most of Thursday. That night I had dinner at Royal China with a friend of mine. We’d booked a table for six people but everyone gradually bailed as the day went on, so we decided to go anyway – and he bought me dinner for my birthday. The food and service were really good. We shared a hot and sour soup with chicken to start and a quarter crispy aromatic duck. For our main course we had the Szechuan prawns and black bean beef with steamed rice and a portion of pak choi. Yum! I was full after all this but we had toffee banana for dessert anyway! It was a quiet evening and I was home by 11pm. I woke up on Friday to glorious sunshine and clear skies. Thank goodness. However, that afternoon my sister and I walked to the Shangri-La to get our hair done and it was so windy that by the time we got there we were covered in sand. It was disgusting. I could feel it down my back (how??) and up my nose and in my throat. Ugh. Luckily the walk home was nowhere near as bad, and even though there was a breeze at Calabar that night, it wasn’t a gale! It was a nice evening. I got to Calabar with a friend at about 6pm and my first guest arrived at 6.30. I had 39 people show up, 22 people didn’t. Out of those 22, some had said they couldn’t make it, some had RSVP’d ‘yes’ but never bothered showing up (rude) and some didn’t bother to RSVP at all (also rude). But I think those that showed up had a good time – I know I did! And then when the bill came, I couldn’t find my debit card in my handbag. I knew it was there because I had checked twice before leaving home and I hadn’t opened my bag so it couldn’t have fallen out at any point. I emptied my bag but it was nowhere to be found. In the end, a friend paid the bill for me. After he’d paid, the waiter said he’d ‘found’ my card on the floor somewhere. It was all very suspicious. And for the next two days I thought I must have been going mad every time I mentioned it as people laughed it off and put it down to too much alcohol. And then I thought they might be right until… a friend told me that when she got home she noticed that her credit cards were loose in her handbag instead of in her wallet like they usually are. So, on the plus side – I wasn’t going mad. On the minus side, the only people who had access to our bags were my guests. And that is a real negative. But, if you were going to go through someone’s handbag, wouldn’t you take the cash instead of the cards? I had AED 700 in my bag and it was still there the next day. None of it made any sense. I had asked everyone not to bring a present, but a few people did get me something. I got: a box of Godiva chocolates, a book of 5-minute crosswords, a spiralbound notebook and two Smythson notebooks – one is black and says ‘Frankly, my dear’ on the front and the other is orange and says ‘Expect the unexpected’ on the front. Lots of notebooks! It’s probably no surprise that I spent all of Saturday at home. I got out of bed at about 1pm, barely able to move. I had lunch, got back into bed and watched an episode of ‘Grey’s Anatomy’ with my eyes closed. I showered, got into different pajamas and lazed around all day. For more updates, click here.